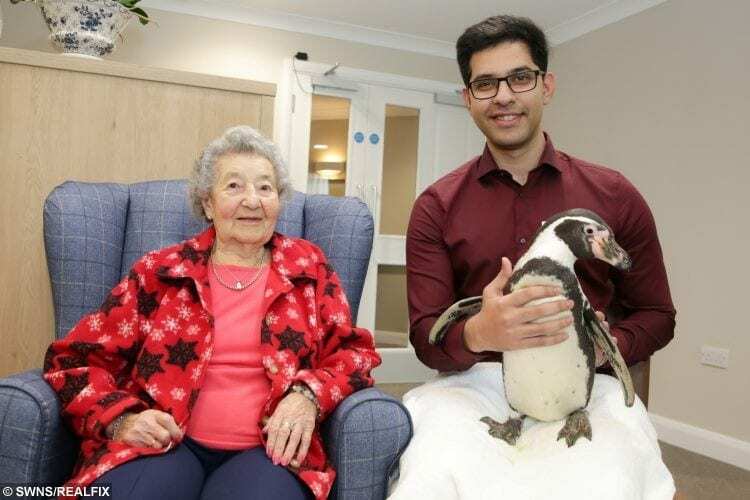 An OAP who loves penguins was given a pppppick-me-up by care home staff – who invited one in to meet her. Annie Thelwell, 92, always wears a penguin pendant and has filled her memory box with photos of the birds. She said she’d always wanted to meet one of the friendly animals – so carers organised one to pop in. 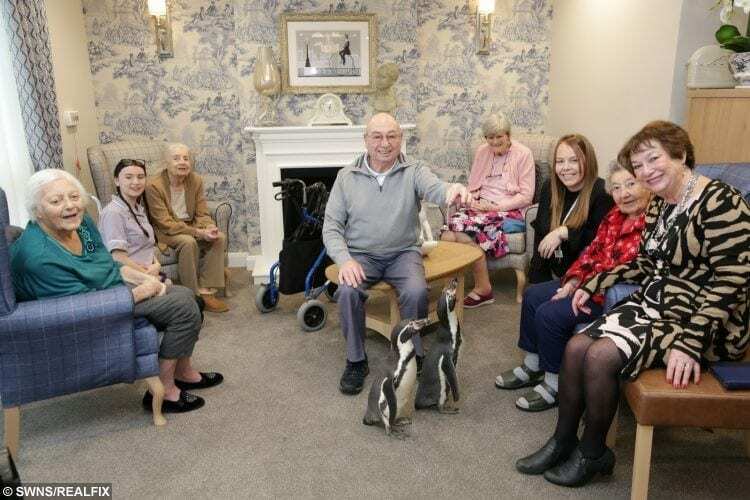 The hand-reared penguins turned up to surprise Annie and other residents at Mountbatten Grange care home in Windsor, Berks. The two Humboldt penguins were brought up at Heythrop Zoo and are friendly and relaxed around humans. Originating in South America, the Humboldt penguins are used to warm weather and can adjust to different environments. Charlie and Pringle live in a specially-constructed enclosure at Heythrop Zoo, which includes a swimming pool, a pebble beach and a penguin house. The pair regularly meet new people and attend workshops and educational talks all around the UK, aiming to raise the general public’s awareness of conservation matters. Mountbatten Grange Home Manager, Saad Baig, said it was “incredible” to see Annie’s reaction after she wished on the care home’s wishing tree to see the birds. He said: “We always like to go the extra-mile for residents here at Mountbatten Grange, and make their wishes come true, no matter how small – or unusual. “We managed to keep the visit a complete surprise, so it was incredible to see her light up when they waddled into the care home. “They are truly wonderful creatures and it was a fantastic moment for everyone involved. “The penguins were so friendly, and we know just how beneficial animal therapy can be for older people, especially for those living with dementia. Next article » Jealous Thug Who Throttled Girlfriend & Threatened To Kill Her Spared Jail After Judge Hears He Has A "Perfect Life"